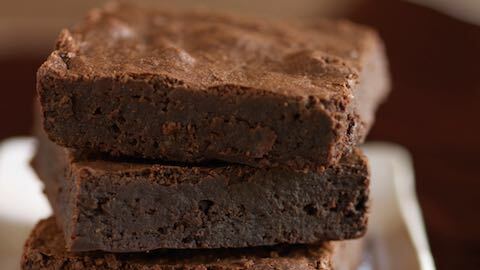 Love is in the air - every day with this sweetheart dark chocolate brownies recipe. 2. In small pot over low heat, melt 1/2 cup of butter and 4 ounces of dark chocolate together until smooth. 3. Add eggs one at a time, and whisk to combine after each addition. 4. Add sugar and vanilla and stir to combine. 5. Add flour, cocoa powder and salt and stir until smooth. 6. Transfer batter into a 9 x 9 aluminum foil lined baking pan and place it into the oven for 25 minutes and bake until done. 7. While brownies are baking, melt together semisweet chocolate and 1 tablespoon of unsalted butter for the glaze. Once melted, set aside. 8. When brownies are done, let them cool. 9. Once cooled, drizzle glaze over brownies, and spread it on top using an offset spatula. 1. Place chilled juices in flutes. Top with Barefoot Bubbly Red Moscato. Garnish with cranberries. For more romantic wines and recipes, visit www.barefootwines.com.